LIVERPOOL (Sporting Alert) — Liverpool captain Steven Gerrard blasted forward Mario Balotelli for showing a lack of respect after taking the penalty which earned the Reds a victory over Besiktas in the Europa League on Thursday night. Gerrard, who was injured and did not play in the game, was replaced by midfielder Jordan Henderson as the skipper on the night and the veteran midfielder says Balotelli should have allowed the England international to take the spot kick. The Italian put away the penalty kick to secure the 1-0 first-leg win, but this was only after an apparent argument with both Henderson and Daniel Sturridge over who should take the spot-kick. “Jordan should have taken the penalty,” said Gerrard, who was working as a television pundit for ITV. “Rules are rules. It should have been Henderson. Mario has been a bit mischievous. 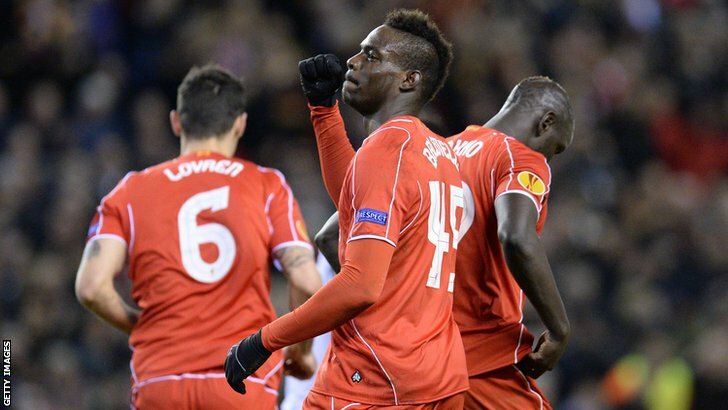 “Credit to Mario, he’s scored, but it’s not nice to see when footballers are arguing. I think Jordan has handled the situation very well. “He can see that Mario really wanted to score. Jordan walked away at the right moment and handled his post-match interview very well. “Jordan is the captain and Mario showed Jordan a bit of disrespect there, but he’s scored a very important goal. “It was a big goal, I thought we kept the ball well at times and we deservedly got the goal at the end. It was a big goal for us and especially keeping the clean sheet,” he told ITV in his interview. “I wanted the penalty, Mario felt confident and he has taken big penalties before. Meanwhile, Liverpool manager Brendan Rodgers reflected more on the final result over what happened on the pitch and he was delighted to keep Besiktas off the scoresheet. “Besiktas came here with big confidence and I believe they have scored in every away game they have played this season,” he said on Liverpool’s official website at www.liverpoolfc.com. “So it shows you the level of our defensive organisation that we kept a clean sheet. Simon (Mignolet) had a really good save in the first half, an outstanding save it was. Rodgers also offered big-time praises to Jordon Ibe, who won the penalty kick that Balotelli tucked away, following some skillful work in the area. “You’ve seen the kid’s performances since he’s come back from his loan period and he is growing all the time,” Rodgers added. “He’s played in big games and is getting good experience at 19. He is a real threat every time he has the ball. Liverpool will continue its preparations for Sunday’s English Premier League trip to St Mary’s to face Southampton as the battle for a top four and Champions League places heats up.